How to find angular velocity of the Earth? 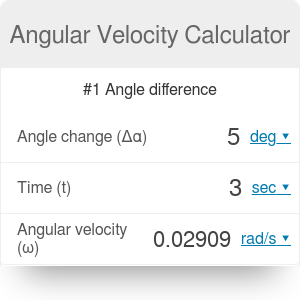 This angular velocity calculator is a simple-to-use tool that gives an immediate answer to the question "How to find angular velocity?". In the text you'll find several angular velocity formulas, learn about different angular velocity units, and, finally, estimate the angular velocity of the Earth! Have you ever wondered what is the relation between angular velocity and angular frequency, or where angular velocity is applied? Read on to find out, and become an expert in the field of circular motion. 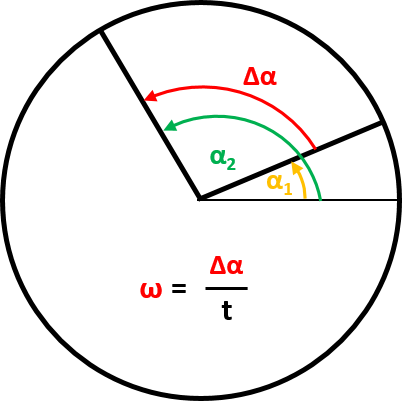 Angular velocity describes the rotational movement of bodies. It measures how fast they move around some center of rotation. We can think about two different kinds of rotations. The first one describes the motion of the center of mass of a given object around a specific point in space, which can be described as an origin. Some examples include planets moving around the Sun, or a car taking an exit on the highway. The second one tells about the rotation of the body around its own center of mass - the spin (not to be confused with the quantum property of particles, also called spin). Surely you've seen a basketball player spinning a ball on his finger. Generally, we can say the faster the movement, the higher the angular velocity. To define some specific values, we have to move on to the angular velocity equations, described in the next section. In this angular velocity calculator, we use two different formulas of angular velocity, depending on what input parameters you have. where α₁ and α₂ are two values of angles on a circle, and Δα is their difference. t is the time in which the angle change occurs. As you can see, for the normal velocity there is a ratio of the positional change in a period, while here we use angle instead of distance. v = ω × r.
where all of these variables are vectors, and |r| denotes the absolute value of the radius. Actually, the angular velocity is a pseudovector, the direction of which is perpendicular to the plane of the rotational movement. RPM or revolutions per minute - the unit which is found most frequently in practical application. Using it, you can describe how fast a wheel or an engine is spinning. You can easily imagine the difference between 10 and 100 RPM. Hz or hertz - the same units that are used for frequency, but rarely used in the context of angular velocity. It is in some way similar to RPM, telling us how many full rotations are made in a given time. The difference is that previously the basic unit of time was a minute, and here it is a second. 1 Hz = 6.283 rad/s = 60 RPM. where f is the frequency. As we can see, it is denoted by the same letter. Additionally, the unit of angular frequency is rad/s, precisely the same as for the angular velocity. So the question may arise: "What is the difference between angular velocity and angular frequency?". The answer is relatively simple. The relation between angular frequency and angular velocity is analogous to the one between the speed and the velocity. The first one is a magnitude of the latter, or in other words, angular frequency is a scalar, whereas angular velocity is a (pseudo)vector. The angular frequency is commonly used when talking about a harmonic motion, an example of which is a simple pendulum. As you can imagine, the motion doesn't have to be represented by a standard rotation, but just a movement which periodically repeats its position. 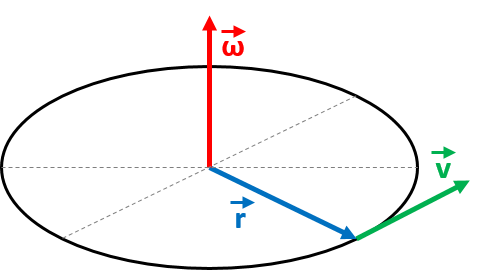 The angular velocity, however, is strictly connected with the motion around some point. Therefore, we can say that angular frequency is a more general quantity and can be used to describe a wide range of physical problems, while the angular velocity includes only rotational movement. or 7.292 * 10⁻⁵ rad/s (using scientific notation). v₁ = r₁ * ω₁ = 6,371 km * 7.292 * 10⁻⁵ rad/s = 0.4646 km/s = 464.6 m/s. To work out the linear velocity with respect to the center of the Earth, all you need to do is to multiply this result by the cosine of the latitude of your city. By the way, have you ever wondered why rockets usually launch from spaceports placed near the equator and not from the poles? Well, almost 500 m/s boost at the beginning is the considerable fraction of its final velocity. So moving the start point as close to the equator as possible reduces the amount of fuel needed to accelerate the rocket. 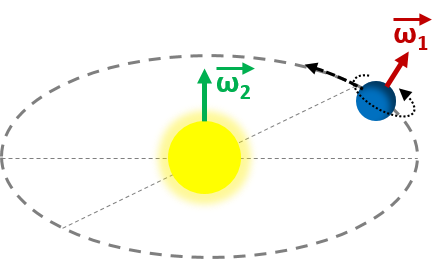 After that, we can ask once again how to find the angular velocity of Earth, but this time the orbital one. All the calculations are analogical, but we have to change the time from 23.943 h to one year, which is about 365.25 days. The angle change is the same, the complete revolution. v₂ = 1.496 * 10⁸ km * 1.991 * 10⁻⁷ rad/s = 29.785 km/s. We are moving pretty fast, aren't we? The angular acceleration - describes how the angular velocity changes with time. The higher the difference of angular velocities, the bigger the value of angular acceleration. The rotational kinetic energy - the measure of energy in circular motion. As with kinetic energy, the dependency of (angular) velocity is quadratic. The centrifugal force - it can be felt in a vehicle when it turns. The faster you take a turn, or the sharper it is, the higher the centrifugal force gets, which can be clearly felt. The Coriolis effect - which causes objects to turn, if they are placed on a rotating body (e.g. on the Earth), instead of moving in a straight line. The system of pulleys - this is not a physical quantity, precisely speaking, but it is an interesting device which is all about angular velocity. The simplest system consists of two pulleys, usually with different circumferences or radii. They are connected by a belt, so their linear velocities are identical, but since they are of different sizes, their angular velocities change proportionally. Knowing this and having some engine with well defined rotational velocity, we can set the angular velocity of the output element with good precision, simply by adjusting its size. where I₁ and I₂ are the initial and the final mass moments of inertia respectively, the quantities which describe the distribution of mass with respect to the center of the bodies. We can see that if the moment of inertia increases, the angular velocity decreases, and vice versa. So, what are the consequences of this phenomenon? Let's imagine that you are a figure skater. When you rotate, you possess some angular velocity. If your arms are wide open, the mass moment of inertia is relatively big. Then, you move arms close to the rest of the body. As a consequence, your moment of inertia decreases, so due to the fact the overall angular momentum has to be conserved, your angular velocity increases - it means you will spin faster! This is no magic, just physics! If you can't don't like skating, you can try to verify the rule with a usual swivel chair. Just remember, safety first! Make sure there is enough space to do this experiment. After that, simply start spinning and see how your angular velocity changes when you move your arms back and forth. Additionally, you can increase the effect by using some dumbbells. As a result, you can combine both exercising and fun into one thing! Angular Velocity Calculator can be embedded on your website to enrich the content you wrote and make it easier for your visitors to understand your message.